This index equity fund has a yield of 1.31%. With low expense fee of 0.20%, this iShares Russell 2000 ETF is popular among investors. Total net assets are $29 billion. This small cap fund has an annual holdings turnover rate of 18%. You can buy this top ETF through your brokerage for retirement or regular investment account. For 401k, please check with your administrator. Invest in ETF can be done with as little as 1 share (i.e. less than $122.38 per share). Morningstar has ranked this U.S. stock ETF with 3 star rating. In 2014, the total 1 year return is 5.03%. The 5 year annualized return is 15.87%. This iShares ETF has returned 7.51% over the past 1 year, and 15.71% over the past 3 years. 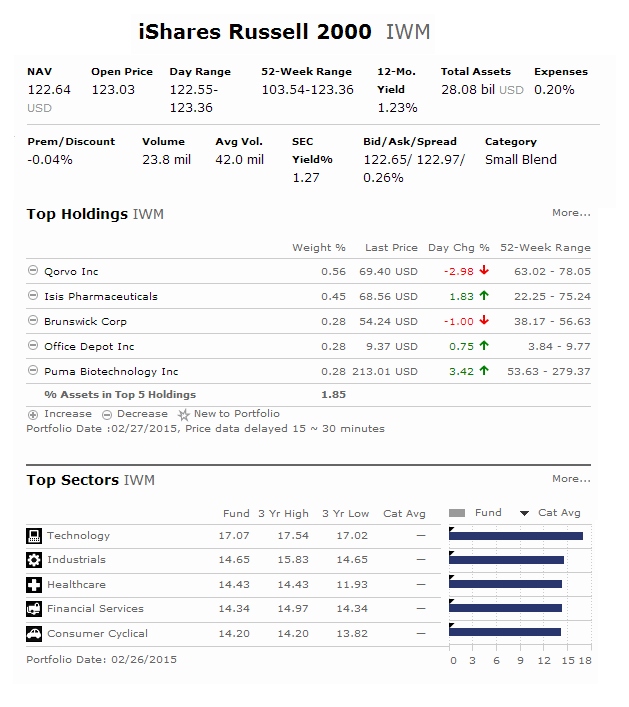 As of January 2015, top 5 stocks are Qorvo Inc, Isis Pharmaceuticals, Graphic Packaging Holding Co, Office Depot Inc, and Brunswick Corp. Top 5 sectors are technology, industrials, healthcare, financial services, and consumer cyclical. iShares Russell 2000 ETF has low expense fee of 0.20%.